Today boys and girls, we are going to travel with a Jewish man who is going out of town on business. Look! There he is. What has happened to him. He looks like he has been beaten. He is bleeding and can't even get up. He is really hurt very bad. Who remembers "The Golden Rule?" That's good! This is the lesson we are going to learn about today. Let's go and see what has happened to our traveler. Look! There are the robbers. They have beaten this poor man and robbed him and left him for dead. They have even taken off some of his clothes. I wonder what will happen to him now? This is a bad situation for this man. I hope someone comes along that can help him. Look, there is a temple priest. He is a man of authority. Maybe he can get some help for this poor man. Oh no! He just looks at him and goes around him on the other side. How awful. Look! Another man is coming up. Maybe he will help this poor man. I can't believe it. He too, passes on the other side and does nothing. What is this poor man going to do? I don't know about you, boys and girls, but I think I would at least try to get this poor man some help. This is not right just to let him lie here and maybe die all alone in the middle of the road. Oh no! It's a Samaritan. He is hated by the Jews and I don't think he will even get off his donkey, let alone help this poor man. He might even let his donkey walk on him. I can't believe my eyes. He is getting off his donkey and kneeling down beside this poor man. He is putting ointment on his wounds and putting bandages on them. This can't be. He despises the Jews. Why would he do anything for this poor man? The man is putting him on his donkey. Let's see where he takes him. 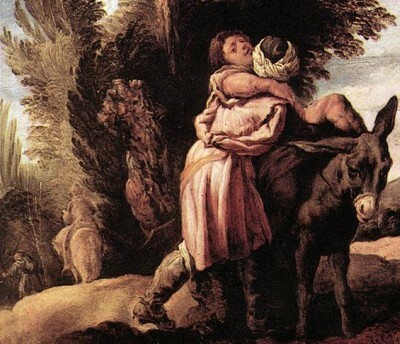 It seems as though he is carrying him into town. 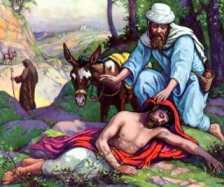 This Samaritan is going into the inn here in the town and taking this poor man with him. Let's listen and see what he tells him. Imagine that. He is telling the inn keeper to take care of this poor man and gives him some money to pay him for his trouble. 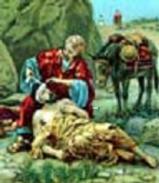 He's even telling the inn keeper to give him the care he needs and if his bill is higher than what the Samaritan has paid, he will pay him what he owes when he returns. This is truly a man that knows what "The golden Rule" is all about! Let's say The Golden Rule together. Great! You did a wonderful job with that! These are just a few words, but they have a very big meaning. They tell us that we should treat others the way we would want them to treat us. Not only that, but we should treat others the way Jesus treated others. Jesus loves everyone. We should love everyone. I know that sometimes people are not the easiest to love. That doesn't mean that we should not love them. We should make an extra special effort to love them. Most children that are hard to love have probably never known the love that you share with your parents. I know that my parents love me very much and would do anything for me. Your parents are probably the same way. Some children maybe are not like you. They come from different parts of the world. Some don't even speak our language. This does not mean that we should not love them. God loves each and every one of us with all His heart and He wants us to love one another the same. There may be children in your school that seem to always want to fight and push people around. These children are really just afraid . If you are nice to them, they will see that they have nothing to be afraid of and will start to treat everyone with kindness. Maybe some children in your school may not have the same clothes that you wear. They may be worn and there shoes may not be as nice as yours. There is nothing wrong with them. Their parents just can't afford to give them nice clothes. They still need to be loved. They need love more than most. So you see boys and girls, Jesus loves us with all His heart and He wants us to do the same for others. Jesus knows all about us, even the things that we think no one else knows about us. He knows all the things that we do that are not pleasing to Him, all the bad thoughts that you might have had at some time, all the times that maybe you weren't as friendly to someone as you should have been. Jesus knows all about our sins and yet He loves us just the same. So why should something as simple as someone not looking the same as we do or not speaking the same language we speak make a difference to us? It shouldn't. We should always treat each other with love and understanding, and forgive one another when we do something that might hurt someone's feelings. How can I love someone who is not lovable? First of all, you should pray and ask God for help and strength that you can have the love in your heart for someone who is not easy to love. Next, you should pray that God will help them to become easier to love and fix what ever is making them so unhappy and hard to love. God doesn't expect us to be able to love everyone all the time. We have to ask Him for His help and strength to love some people. Is it the person next door? No, your neighbor is everyone else in this whole world. We have lots and lots of neighbors. If you think about it, there are a lot of ways that we can love people. We can love them by doing something good like helping an elderly person, reading to someone who can't see. Sharing your lunch with someone who doesn't have a lunch, helping your parents by doing chores around the house, mowing your grandparent's yards in the summer, taking toys that you don't play with to shelters for children who may not have any toys, carrying packages for an elderly person, and the list goes on. I want you to think about ways that you can show love to others and do something each day for a week. I promise you if you do, you will be surprised at how much better you feel and how much brighter your life will be. Just a couple of verses that might help you to understand showing God's love a little better. The verse in Matthew tells us that we should honor our father and mother and to love our neighbor as ourselves. This means that we should love our parents and to love others as well. The verse in Romans tells us that love doesn't do wrong to others. It only does what God would have us to do according to His laws. This is simply to love others. 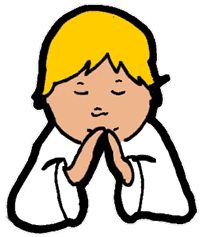 Let's pray a prayer before we close this session. Jesus, thank you for your love for me. Help me to have more love for the people in my life. Help me to love other people the way you do. Help me especially to love those who are hard to love. I hope you enjoyed our time together. I look forward to spending time with you again very soon..
Great story Dian! I love how I felt like I was really there seeing it all for myself.